Untitled, 1992. Pastel on paper, 29 1/2 x 21 3/4 inches (74.9 x 55.2 cm). Collection of the Joan Mitchell Foundation, New York. Lehigh University announces an exhibition of work by noted Abstract Expressionist Joan Mitchell at the Zoellner Arts Center Main Gallery from January 16 – May 19, 2013. 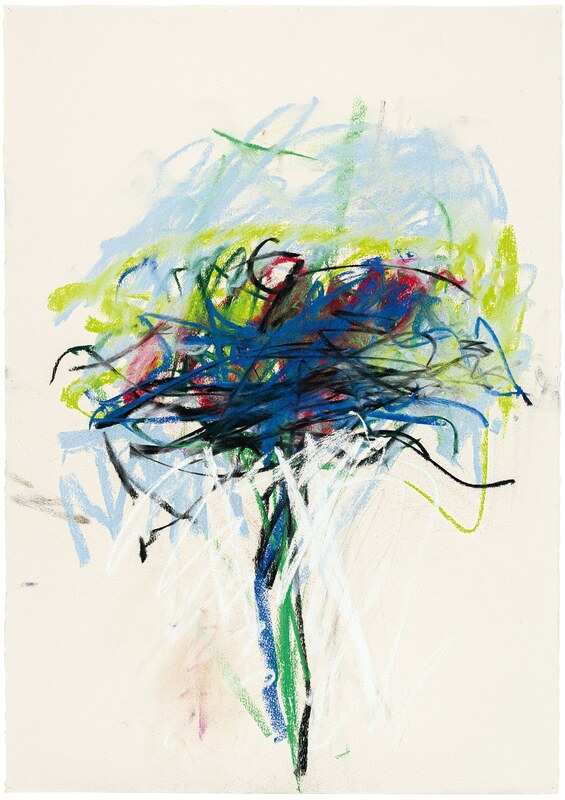 Joan Mitchell (1925-1992): An American Master – Paintings and Works on Paper is presented courtesy of the Joan Mitchell Foundation and Cheim & Read Gallery, New York. Mitchell’s early success in the 1950s was striking at a time when few women artists were recognized. During the almost fifty years of her painting life, her commitment to the tenets of gestural abstraction remained uncompromising. The curator Klaus Kertess wrote that Mitchell “transformed the gestural painterliness of Abstract Expressionism into a vocabulary so completely her own that it could become ours as well. And her total absorption of the lessons of Matisse and van Gogh led to a mastery of color inseparable from the movement of light and paint.” Her compositions, calligraphic rhythms, bold colors and sweeping brushstrokes reflect and transform the elements of Mitchell’s interior landscape: water, sky, trees, flowers, weather, dogs, people, and places. Born in Chicago, Mitchell studied at Smith College and graduated from the School of the Art Institute of Chicago in 1947. Following graduation, she was awarded a James Nelson Raymond Foreign Traveling Fellowship that took her to France, where her paintings moved toward abstraction. Mitchell returned to New York in 1949 and participated in the famous “Ninth Street Show” in 1951, with other artists including Jackson Pollock and Willem de Kooning. She soon established a reputation as one of the leading younger American Abstract Expressionist painters. In 1955 Mitchell began dividing her time between New York and France, and in 1968 she settled in Vétheuil, a small village northwest of Paris. She was prolific in that setting, surrounded by trees, gardens and the River Seine. These surroundings informed her meditations on nature, and the high ceilings of her studio allowed Mitchell to work on larger canvases and create multi-paneled works. Although she lived and worked in France for the rest of her life – until her death in 1992 – Mitchell’s work continued to be exhibited regularly in New York. This exhibition brings together paintings, prints and works on paper from significant periods of Mitchell’s career. The works on display range from delicate, small pastels to bold, large multi-panel paintings – each work radiating its own force, weight, light and presence. Through careful study and comparison, the viewer can understand the development of Mitchell’s palette and sense of color, her collaboration with various printmakers, and her exploration of scale. Events and activities in conjunction with the exhibition include two lectures and receptions at the gallery: January 31 at 5 p.m. Laura Morris, Archivist of the Joan Mitchell Foundation, and March 21 at 5 p.m., a scholarly lecture: speaker to be announced. Family activities are planned for children and accompanying adults to provide an understanding and appreciation of the exhibition. Please call 610-758-6881 for information on tours. All events and programs are free and open to the public. The Joan Mitchell Foundation celebrates the legacy of Joan Mitchell and expands her vision to support the aspiration and development of diverse contemporary artists. Through art education programs, artist grants, exhibitions and publications, partnerships with arts organizations, and an artist-in-residence program at the Joan Mitchell Center in New Orleans, the Foundation works to broaden the recognition of artists and their essential contributions to communities and society. The main gallery at Zoellner Arts Center is open Wed – Sat. 11-5 ; Sun. 1-5 and for special evening events. Chatiére, PDF download, 2.2 MB. Trees I, PDF download, 1.9 MB. Untitled (Pastel), PDF download, 1.3 MB.